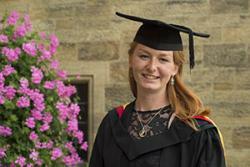 A former Shrewsbury High School Head Girl graduates with a first class degree at Bangor University this week. Rosamund Green, 22, from Maesbrook village near Oswestry in Shropshire was excited to receive her BSc Zoology with Animal Behaviour degree. Ros comes from a family of high achievers, both her parents went to Oxford University, and her sisters received degrees from Cambridge and Imperial College. Ros has been interested in nature and animals for as long as she can remember, and this has developed into an academic interest over the last 8 years. When Ros applied for university, she knew she wanted to study zoology, but it was only in her gap year that she got particularly interested in birds. For the last 4 years she has dedicated a lot of time to studying birds, getting her bird ringing permit in just 2 years after starting training, learning a wide range of identification and surveying skills and making ornithological contacts. All of these plus the knowledge she gained during her time at Bangor University, has led to her getting a job as a self-employed ornithological surveyor on Skomer Island off the coast of Pembroke in April, before finishing her degree. Ros said: “Bangor’s awesome location drew me to it immediately. I love outdoor sports and no-one can resist Snowdonia and the amazing clubs that Bangor has. I also had a brilliant time at the School of Biological Sciences’ open day, and a very long and informative chat with senior lecturer, Dr Nia Whiteley, which made me think Bangor was the place for me. “During my studies I did do a lot of volunteering with local groups. This was hard work to organise around university work and lectures, but actually really helped with my degree. It gave me practical experiences to underpin the theories learnt in lectures. It also meant I met academics outside of lectures regularly, who would point me in the right direction of further reading. “I’ve done a lot of interesting things whilst at Bangor. The main one being getting involved with bird ringing along the north Wales coast. I do Wader cannon-netting throughout the winter, and then mist-netting on Anglesey during spring and summer. Also, after a field trip, I volunteered for a month at Bardsey Bird and Field Observatory which was incredibly valuable for my current career path. “I joined many clubs in my first year, the climbing, kayaking, scuba-diving, and mountain walking clubs, and also the Zoology Society and the Students for Treborth Action Group, which helps with all aspects of Treborth Botanic Gardens. As the University and external volunteering work load increased, I dropped some of these clubs in my second and third year, and joined external clubs and societies such as Bangor Bird Group and Tenovus sing with us choir. “The highlight of my time at Bangor was undoubtedly the third year Tenerife fieldtrip. This came at the end of some very, personally, difficult months and was an amazing break. The staff were fantastic and boosted my self-esteem to a level I’d never felt before. My fellow students were brilliant and I’ve made friends that I’ll keep for life. We saw and did some incredible things, and it really served to show me that field work is the thing I’m best at and most enjoy. “I’d eventually like to be well known within the ornithological ringing community, but for now I’m happy taking whatever field contracts comes up. Overall I just want to end up with a job I enjoy and one that is, ideally, close to north Wales.